My goal is for this site or www.sunandsky.net to eventually display in graphical form much of the data collected at Geronimo Creek Observatory, Texas, and during annual calibration trips to Mauna Loa Observatory, Hawaii, and during field trips to Brazil, Alaska, Switzerland, Mexico, Japan and various portions of the mainland United States. For now here are some of the time series of data collected at Geronimo Creek Observatory at or near local solar noon when the Sun was unobscured by clouds. All data shown here have been previously published or discussed in peer-reviewed papers with the exception that these data are updated through early 2004. Unless otherwise stated, each data point represents one or the mean of three manual observations. Nearly all data were collected by Forrest M. Mims III. Some of the data points are by Minnie C. Mims, Eric R. Mims, Vicki R. Mercer and Sarah A. Mims. TOMS ozone data courtesy of NASA's Goddard Space Flight Center. Flow of Guadalupe River courtesy of U.S. Geological Survey. The total ozone column refers to the amount of ozone in a vertical column from the surface to the top of Earth's atmosphere. Ozone absorbs ultraviolet-B (300 nm to 320 nm) and orange light (the Chappuis band peaking between 580 nm and 615 nm). Column ozone is measured by pointing a Sun photometer at the Sun. Because UV-B is absorbed much more efficiently than wavelengths in the Chappuis band, most measurements are made using UV-B. Because ozone absorbs the shorter wavelengths of UV-B more than the longer wavelengths, the ratio of the UV-B at two different wavelengths is proprotional to the amount of ozone between the instrument and the Sun. The measurements must be corrected for the Rayleigh scattering by the atmosphere and the angle of the Sun to arrive at the total column ozone in Dobson units (DU). One hundred Dobson units (100 DU) corresponds to a layer of ozone 1 mm thick at standard temperature and pressure. The mean ozone over Earth is around 300 DU. Thus, a layer of gas only 3 mm thin protects life on Earth from destruction by intense ultraviolet sunlight. 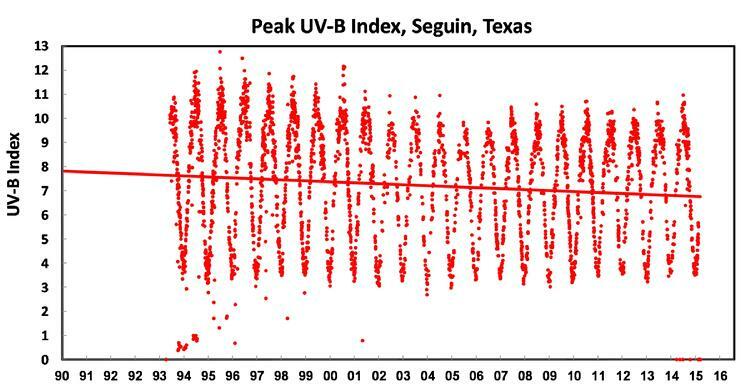 Direct UV-B at 300 nm and 305 nm have been measured at Geronimo Creek Observatory since May 1988. 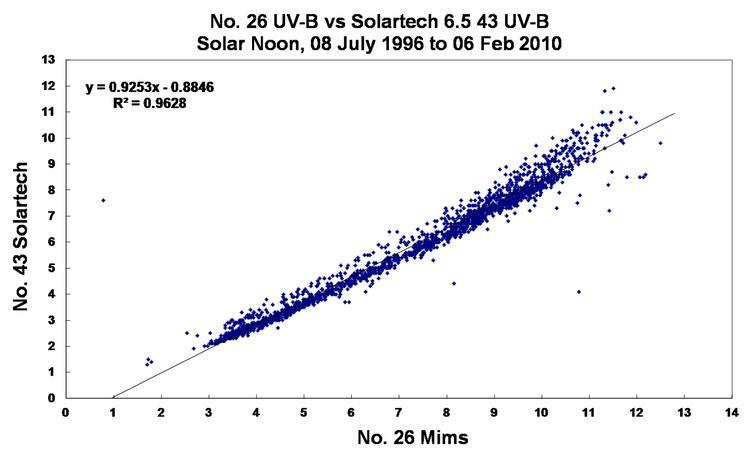 The time series below shows full sky UV-B measured since 1994 by a simple UV-B radiometer having a Teflon diffuser that provides good cosine response (No. 26). The detector is a gallium phosphide photodiode that is solar blind to the red light leaked by the UV-B interference filter. Besides the full sky irradiance shown below, the diffuse UV-B from the sky is measured by briefly shading the diffuser with a disk on a thin rod. The ratio of the full sky to the diffuse sky irradiance is modulated by haze and clouds. Most of the spikes in UV-B are caused by reflection of sunlight from clouds near the Sun. Note the downward trend in UV-B in recent years. 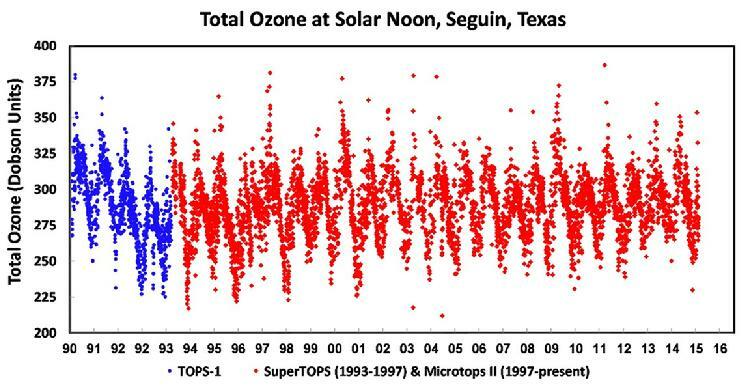 This is associated with an upward trend in total ozone at this site. 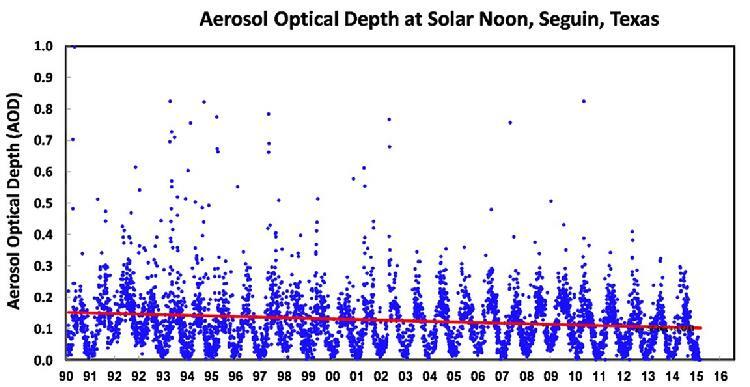 The Aerosol Optical Thickness (AOT) or Aerosol Optical Depth (AOD) is a haze index. AOT is a dimensionless logarithmic term that expresses the attenuation of a direct beam of sunlight caused by atmospheric aerosols (microscopic droplets and particles of dust, smoke, sulfate, salt, pollen, etc.). A high value means the sky is hazy. A low value means the sky is clear. Note that AOT (blue in time series below) has a distinct annual cycle. The sky is much cleaner during winter than during summer. Note how this is closely associated with temperature. Note also how the AOT during the winters of 1991 and 1992 was higher than normal because of the eruption of Mount Pinatubo. The reduction in temperature (red in time series below) following the eruption (June 1991) is quite obvious, as is the gradual recovery to normal levels. Various spikes in AOT are from regional pollution events, Mexican smoke and dust storms from West Texas, North Africa and Asia that reach Texas. The time series chart below shows the total optical thickness, which is the AOT plus any contributions by water vapor. The total water vapor column or precipitable water (PW) is the amount of water vapor in a vertical column from the surface to the top of Earth's atmosphere. Column water vapor is expressed in terms of the depth of liquid water produced if all the vapor in the vertical column is condensed as a liquid at standard temperature and pressure. PW at Geronimo Creek ranges from as low as a few mm to more than 60 mm. Water vapor is by far the most potent of the greenhouse gases. Thus, long term changes in PW might reflect changes in climate. Note the sharp increase in PW during 1999 in the time series below. Note also the comparatively low PW during 2003. 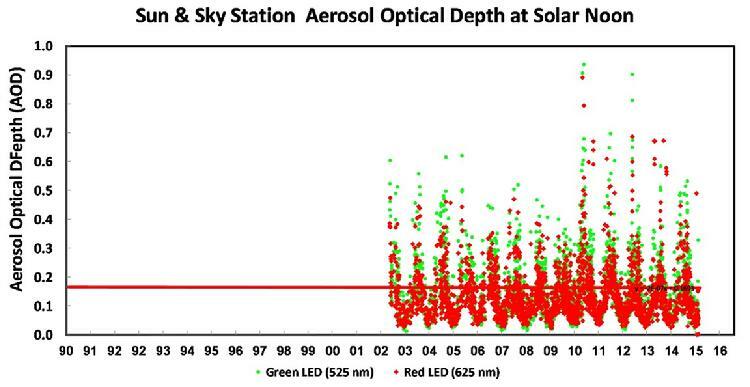 These data are from the first Sun photometer to use light-emitting diodes as spectrally-selective photodiodes. Thus, this instrument is not subject to significant long term drift. 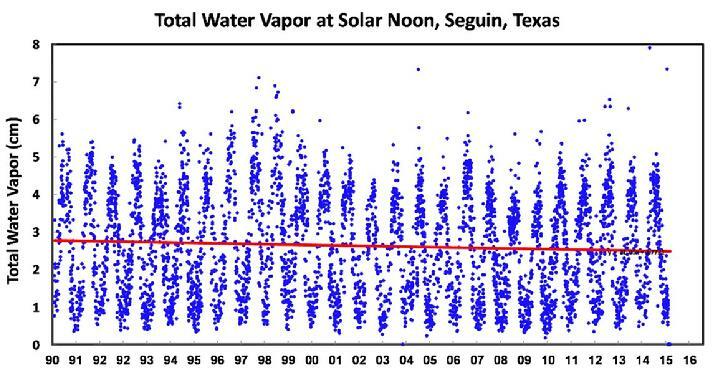 These data are based on new calibrations conducted in 2002 against the NOAA GPS water vapor instrument at White Sands Missile Range, New Mexico, and the Goddard Space Flight Center Aeronet Cimel Sun photometer at Mauna Loa Observatory, Hawaii. Since 2006 a comparison is being made with a NOAA GPS PW site at San Marcos Airport. Results are very good. In contrast with assumptions by climate moderlers, PW at this site has declined >1 mm/decade since 1990. Warm air can contain more water vapor than cool air. Thus, the total column water vapor is higher during summer than during winter. This is illustrated in the xy scatter plot below. Temperature (y axis) is expressed in degrees Fahrenheit, because the Fahrenheit scale has higher resolution than the Celsius scale. This plot is one of many xy scattergrams used to show the interrelationship of atmospheric variables at Geronimo Creek Observatory. When the relationships have a high correlation, mathematical functions can be fitted to the data to provide algorithms that predict one value (e.g. UV-B) when the other (e.g. total ozone) is known. The datasets being collected at Geronimo Creek Observatory provide a unique opportunity to study annual growth of trees at the site and nearby. Of particular interest are baldcypress trees (Taxodium distichum) that line the banks of the Guadalupe River. Because these trees receive a generally constant suppy of water, it is hypothesized that changes in annual growth rings may denote changes in sunlight exposure caused by cloud cover and massive air pollution events. The annual growth rings of the crown branches of a distinctive variety of these trees are very clear and easily studied. The plot below compares the width of the rings of a crown branch of one such tree with the river flow. This work was presented at the 2003 meeting of the Texas Academy of Science. Paper in preparation. A major flood on the Guadalupe River on July 4, 2002, downed many baldcypress trees (Taxodium distichum) and made crown branches available for study. The cluster of trees at left includes a distinctive variety of baldcypress (trees at left) and conventional baldcypress (trees at right). Note that the upper branches of the trees at left are more perpendicular to the trunk than the upper branches of the trees at right. Based on ring counts of downed trees, the trees at right are older than the trees at left, even though the latter are larger.